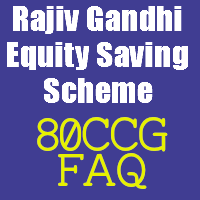 Deduction u/s 80CCG is given for investment in Rajiv Gandhi Equity Saving Scheme (RGESS) . The deduction under 80CCG of the Income Tax Act is in addition to Rs 1 lakh under section 80C. But this deduction could noot become popular on account of too many restriction and conditions. Finance Act 2013 has brought in few fundmental changes in provision u/s 80CCG of the I.T.Act which will surely make this deduction popular. Previous articleInterest to Foreign Branch of India Bank Liable to TDS ! Next articleSection 10(23)(c): What is Meaning of Education ?